I am really glad I enrolled in Ann Peterson’s “Quilting Big Projects on a Small Machine” Craftsy course. (I snatched it up when it was on sale too!) This project was way out of my comfort zone and, as I’ve said before, beginners need an expert to hold their hands. 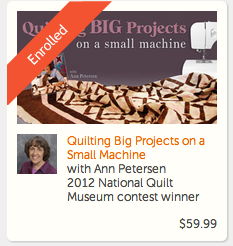 Craftsy courses are video lectures by some amazing craft teachers, including the fabulous Gertie and Kenneth D. King. In addition to the professionally produced videos, the courses provide downloadable course materials and access to a handy note-taking system. However, the best part of the course, in my opinion, is that the instructor is available to answer any questions that you have. I have only had a chance to get through the first five out of eight lessons, but they are the only ones that apply to finished quilt tops. I can always come back to the course later to finish up if I want. Knowing Ann had my back, I tackled the quilting project. 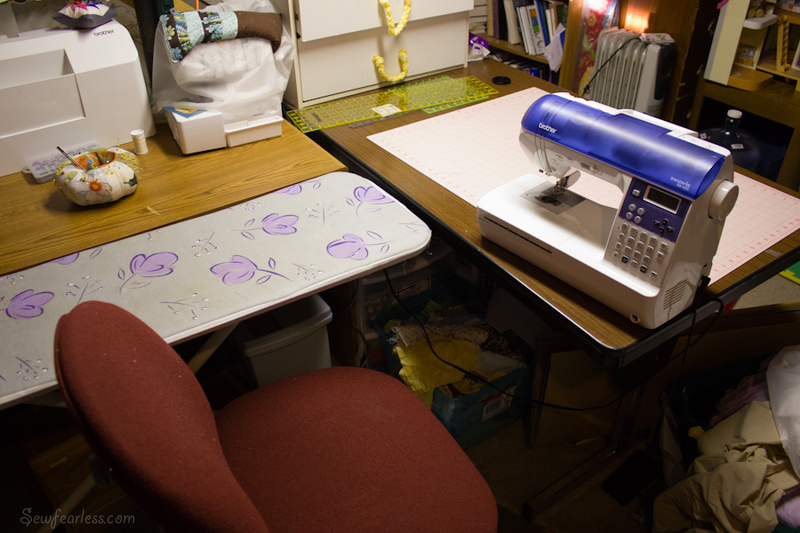 First step, I set up my quilting area. 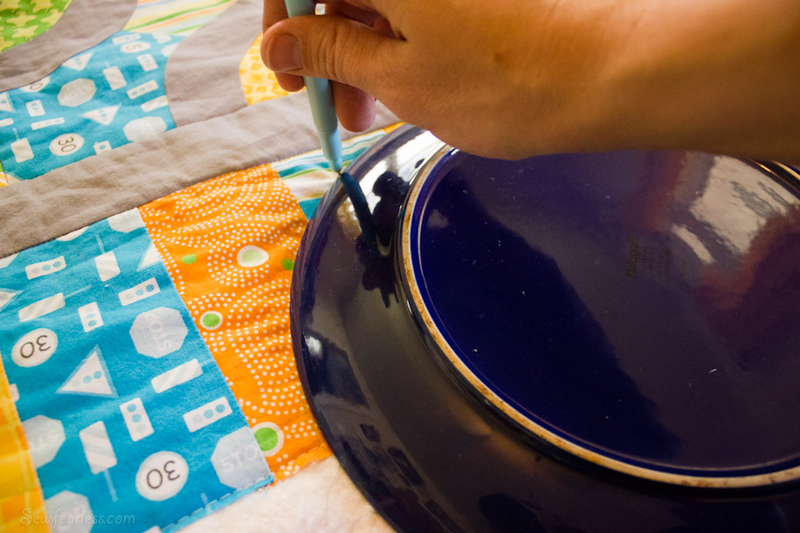 I am not a regular quilter and I don’t have one of the expensive and fancy quilting tables. Instead, I made the biggest area I could out of a table, desk, and ironing board. I needed all that room to support the quilt as I was working on it. Not perfectly ergonomical, but I am not going to be quilting on a regular basis. Then I set up my machine with a walking foot, an Ann-recommended size 14 “Topstitching” needle, and threads for the top and bottom. I took another tip from Ann and tested my stitches on the extra batting at the edge of the quilt. Then, I “ditched” the borders and blocks. Sounds easy enough, but I quickly discovered just how terrible I am at quilting. 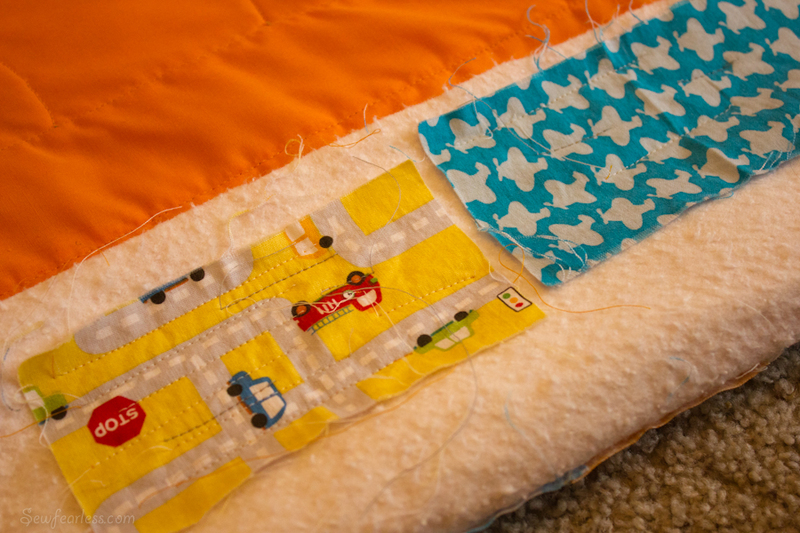 My stitches wobbled all over and sometimes the quilt would not feed properly and the stitch length was affected. 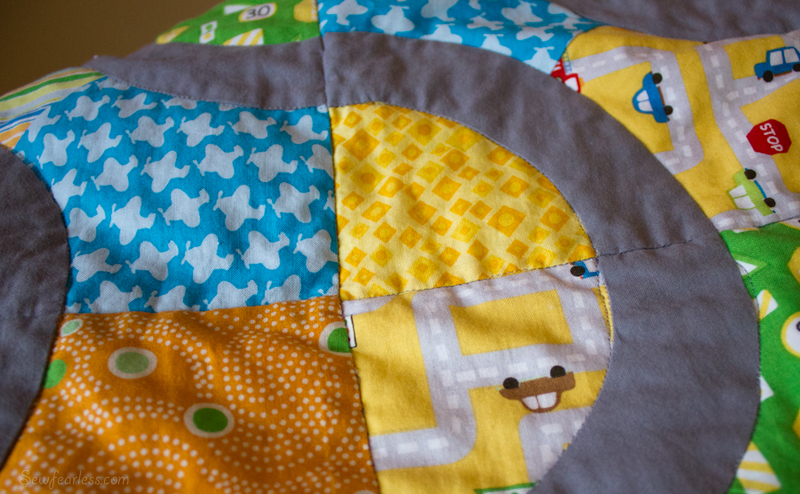 Next, I decided to ignore the “Avoid quilting patterns with a lot of turns” advice and decided to ditch the road. Maneuvering a twin sized quilt around those curves was not easy, and the “road” is a lot longer than it looks. Plus, I decided to use grey thread because I crossed over top of the grey roads, so you can really see the mistakes on the yellow parts. wonderful. Seriously, the whole quilt looks like this, and there are lots of little puckers where the lines of stitching come together too. Look at this face. Do you think he cares that his mom did an amateur job on his quilt? 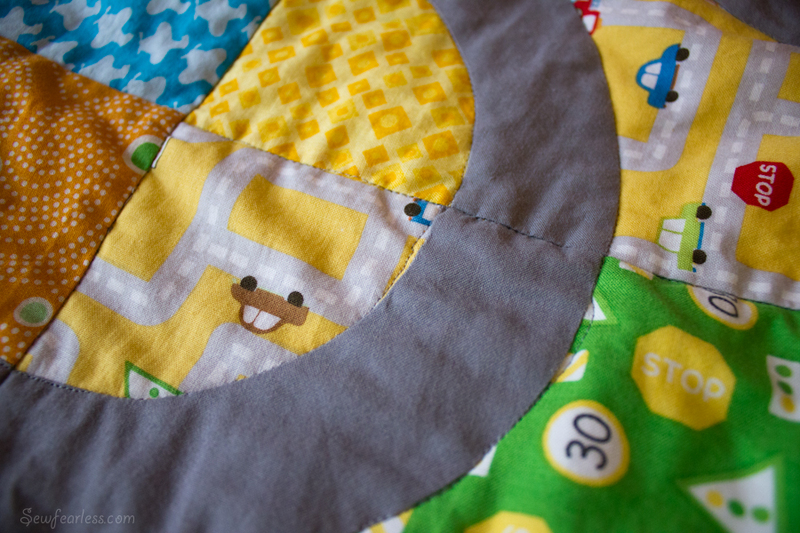 …if my kids will let me have the quilt back to finish it. Update: This project is now finished! Jodi it is amazing, you did such a great job on it. He smile is worth a million. Yikes! It must have been rough to maneuver around those curves. Did you stick with the walking foot or switch to a free-motion foot? Wow, great job Jodi! I just quilted my first purt’ neer quilt sized quilt on my home machine, and I felt like I was wrestling an alligator the whole dang time. I made plenty of mistakes, too, but I learned a whole lot in the process! I LOVE Craftsy. I sign up for so many classes- if you get them right when they come out, they are often only $20! Oh, it looks wonderful! Of course it’s perfect; look at that face! Never mind that your grandchildren will be playing on it someday and you’ll still be able to all those little (Amish inspired, I’m sure) wonky lines, no one else will! What a treasure! It’s beautiful hun! You are doing such an amazing job. As someone who is still learning the quilting ropes myself I commend you for taking on this project! Gorgeous work! Fantastic! You should be so proud of this family heirloom you created! 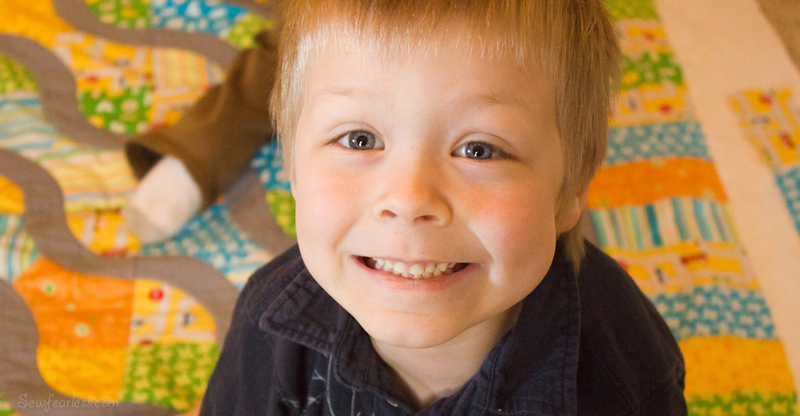 If a smile is worth a thousand words…you just got a thousand “Thank-you’s” from your little ones!…and nothing says “My Mom is just the BEST EVER!” like the expression on your sons face! So inspiring…watching the progress…and the fruition…SO WELL DONE! I have to say I love this quilt, little quilting slips and all. I am doing the Craftsy Block of the Month class in an effort to learn how to quilt. 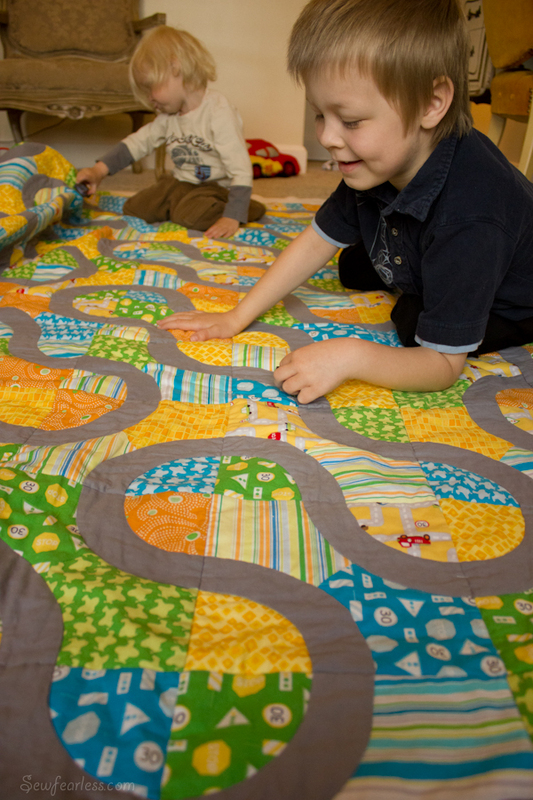 Then, I want to try a quilt like this – those little roads are just amazing and would be great for stimulating a child’s imagination. Your quilt is so sweet. Mommy, your little one will cherish that quilt even when he is married. You did a fantastic job and should be proud of yourself. 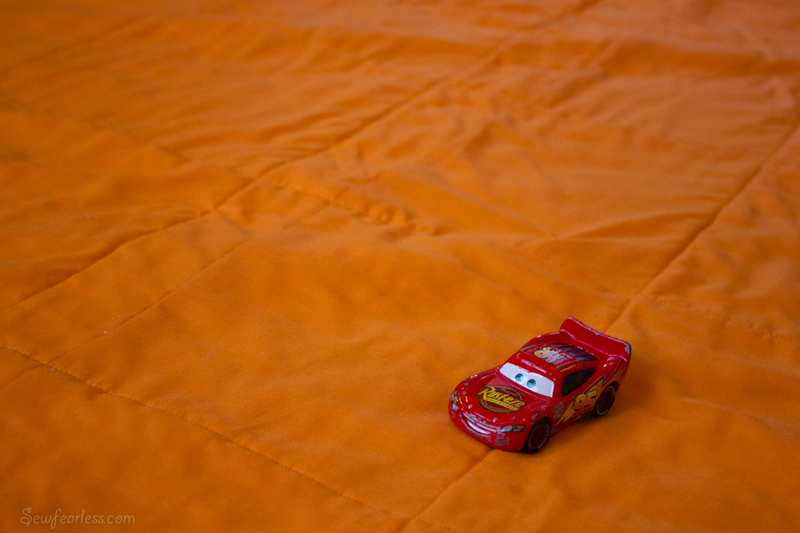 The colors are so bright and cheerful and just think…..when he is tired of playing he can just roll himself up in that quilt that was made full of love and for “special him”. Thank you all for your kind words. I’m really getting very excited about how this project is turning out. If I had made a quilt like that when my kids were that age I would have been thrilled. It’s a very pretty quilt, good color choices. It wouldn’t really be any better if it was perfect. It looks fabulous. And like you said he will never know the difference. But he will remember all his life that his mother made that for him. If you will use the spray on basting to baste your quilt together you will not have any puckers if you make sure there are none when you put it together. And you can almost quilt without a walking foot if you want. Great job! Jodi, please venture the dark side and plunge into free motion quilting.. and do swirls and circles, wayyyyyyyyyy forgiving that stitch in the ditch. It is very enjoyable too! I love your quilt and commend you on your bravery! I am new at this, too, and love the classes thru Craftsy. I have this one but haven’t watched it yet. My latest trick is to avoid stitching in the ditch and stitch just to the side of it on both sides. It gives a nice look and is way, way, way easier than trying to stay in that darn ditch! Good luck getting the quilt back to get that binding done! Absolutely priceless, love the look on your sons face, there is love in every stitch, my motto is “It’s not going in the Smithsonian, have fun, enjoy the process.” and I do! You did a great job, my mom would have said~you’ll never notice it on a trotting horse! My first machine stitched quilt (alone and not with a teacher nearby) was for my grandson. I said the same mantra you did and my grandson loves his Diego quilt! 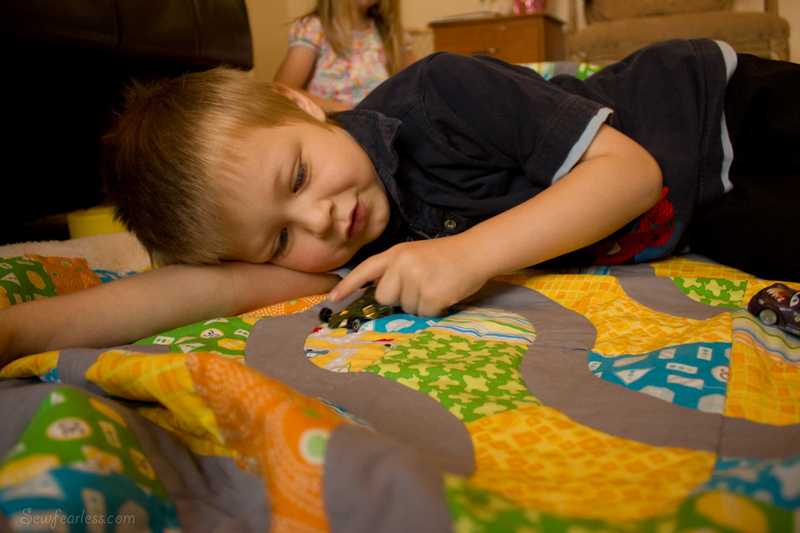 I later made him a summer quilt with airplanes and even in the winter he alternates the quilts on his bed and drags them all over the house. I’ve since made about 10 quilts and I get better with each one. My daughter even asked me to make quilts for her in-laws. I am a quilter. 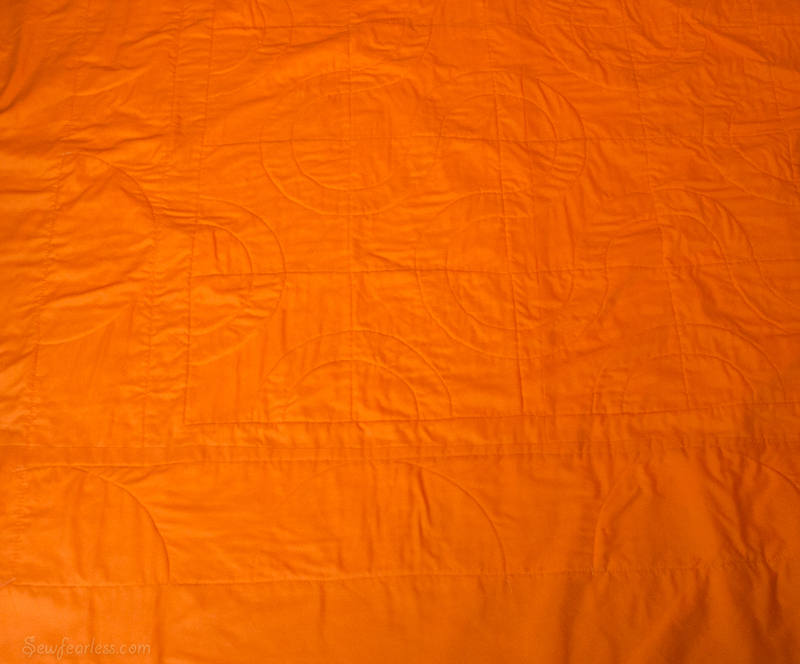 My quilts proved warmth and comfort and pleasure. Looks great. You were very brave to tackle a twin size quilt. It looks like it will get lots and lots of use (and not just on the bed for sleeping.). It will be a cherished quilt for years to come. You learned a lot of lessons (one is that grey really is good for blending in with a lot of colors). Keep up the good work and practice. Wonderful! The quilt is perfect!! It meets the needs and wants of the recipient!! 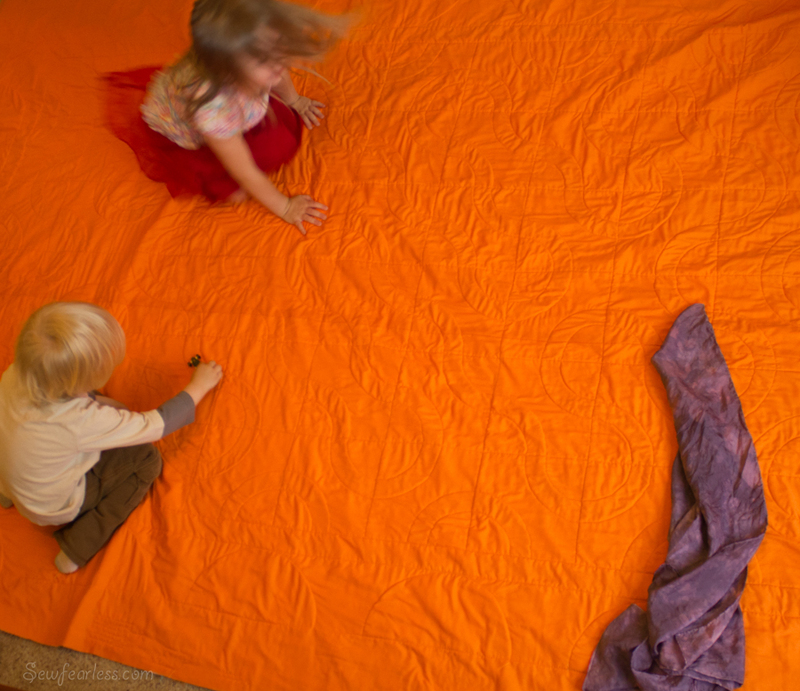 As a mom of two sons who had a smaller road quilt and loved it, I know that this is a priceless gift that you gave your children. Love, love this quilt! I gathered all the materials, book, and the curve master. I have finished the first two rows and it is fantastic. I can’t believe I was able to do it! I did cut with a rotary cutter and template and plan on using FMQ foot to stitch in the ditch. 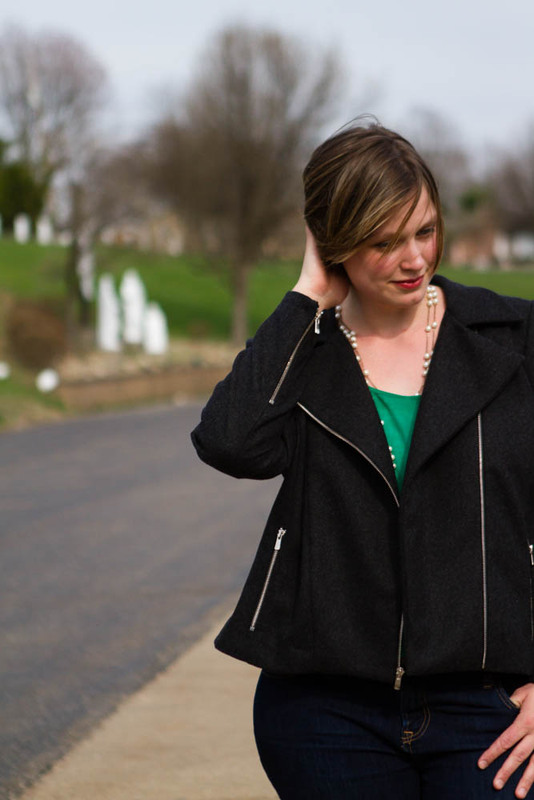 YOU ROCK – Like other people said it is now 3 years later and it still is wonderful! And I bet the kids will even take it to college with them. I think I will try and I repeat try to make one for my wee ones. I have found that if I go slowly, use a free motion foot (which I just used for the 1st time last year 2014) Used to muscle through it. Anyway I love the sweaters. I could wear them as mittens!